Yes, that's right - two moms and ten babies. No wonder they're sharing! The one thing that keeps this job exciting, new and fresh is that EVERY single situation we handle is unique because no two cats are alike, of course! One of our volunteers, Michelle, came across this little family as a result of her scouting around her neighborhood. Periodically new cats would show up at her house and she couldn't figure out where they were coming from. So, she did some recon and came across an older gentleman who was feeding many (10+) cats. He welcomed her offer of spay/neuter assistance enthusiastically and then queried...."Can you help me with the two litters that were born in my house?" What could she say? Of course she had no idea what she was getting into, but what started out as a scary proposition has turned out to be a heartwarming encounter. Although the situation was a bit tenuous at first....the cats and kittens have settled into a routine, become accustomed to their new surroundings and new foster family and are one happy little tribe! 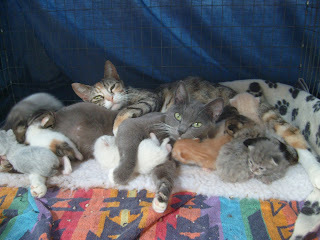 She thinks that the calico may be the gray girls mother. Calico is a much more experienced mother and not only takes care of the babies, but she also grooms and takes care of the gray mother. The mothers share responsibility for nursing the babies.....all ten babies will be nursing on one mother while the other rests. The mothers take turns eating their wet food treats. One day the calico goes first, the next day the gray momma goes first. When the kittens were first presented to Michelle, five of them had their eyes open and the other five were still closed....now we have no idea who belongs to whom. And, even as young as two weeks old, Michelle says you can see their individual personalities emerge. One little gal in particular is very curious wobbling all over the enclosure exploring every inch. Here we go again.....another kittens season. Watch for their progress on our Facebook page!! I had two sister cats who had babies at the same time. The sisters acted as midwifes for each other and pooled the babies for nursing. It was so sweet!